Find hotel near Kakum National Park Entra ..
Home to a wide variety of flora and fauna, Kakum National Park is the best place to visit in Ghana. Located on the coast of southern Ghana, this natural place is known for its refreshing environment. Once you are here, you will be provided a trained guide who will take you on a tour of the place and will describe the medicinal values of the plants present here. You will be able to see some endangered species here such as forest elephants, bongo antelopes and Diana monkey. It is also an ideal place for birdwatching as many migratory birds such as parrots and hornbill gather here. The most popular activity in the forest is walking on the Canopy Walkway that offers a panoramic view of the place. From here, you can visit the Cape Coast which is a beautiful sandy beach. Hotels like Valleystreams Hotel, Urbano Hotel and Roots Apartment Hotel will solve your problem of where to stay in Accra. Very lovely environment, friendly and well informed staff. Lots of local and cultural heritage arts. Restaurant served variety of dishes. A Great opportunity for young adventurers and old ones as well. Scary but fun filled canopy walk. Adrenaline filled. Lots of people to easily socialise with. Great and neat environment, with a picnic park. Well demarcated with sign posts all around. It's a great place to visit. Very nice and lovely place. One of the beautiful things about kakum is that you get to learn about a lot of things and also about the animal and insect inhabitants before you embark on the canopy walk— which is very very scary but fun. 10/10 I recommend. Btw, some people sold fake honey to me there. This is a wonderful park. We took the opportunity to spend the night. Our guide Samuel, should be listed as a national treasure. What a love and reverence for plant life and knowledge of their benefits. I would recommend bringing a light sheet or blanket for the overnight. They provide mosquito nets and bare mattresses. Also, either bring your food, or buy some from the restaurant on your way in. After the night hike you'll be thirsty and hungry. Well worth it. Fun place. If you have an adventurous mindset, you will definitely love this place. 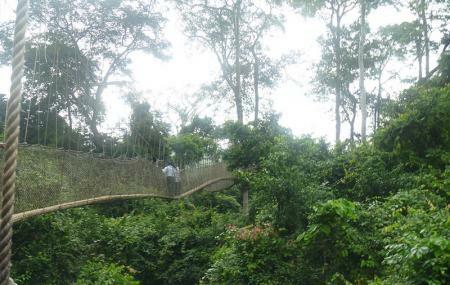 What makes Kakum park a worthy place to visit is the thrill of you get during the canopy walk. I also enjoyed fresh coconut during the hornet to the canopy which is a good reflection of the fresh insight you get when you encounter variety of botanical plants. I was surprised to know that during early morning visits there are even elephants that can be sighted.